Ruspolia project funded by the Flemish Interuniversity Council (VLIR-OUS) has released a technical brief on grasshopper production system. The consumption of the naturally occurring longhorn grasshopper, Ruspolia differens locally known as senene, is an important part of food culture in several regions of East-Africa and contributes significant protein intake of the rural and urban population. For many households, trade in edible insects is a major source of income and considerably contributes to improvements in livelihood. Grasshoppers have traditionally been harvested seasonally from the wild. This method of collection can be unsustainable for the wider ecosystem due to overharvesting or destructive techniques. One of the main benefits of utilizing insects as part of the human diet has been their beneficial nutritional profile, comparable to conventional meats such as chicken and beef. Although farming technologies for other insects like the cricket (Orthoptera; Gryllidae) are fairly advanced in Asia (e.g. Thailand, Laos) and East Africa, equivalent knowledge for its grasshopper is lacking, especially given the popularity of its consumption. In the case of grasshoppers, preliminary studies performed in Uganda have shown that R. differens can be produced under small-scale laboratory conditions but several aspects of its biology need to be evaluated to optimize production techniques. This brief provides an overview of harvesting and rearing systems for the Ruspolia grasshopper. It provides an outline of wild harvesting, rearing facilities and management practices, as well as how to rear insects under the prevailing local conditions. Download the brief here technicalbrief1. The Board and Editor of Food Control Journal: I humbly and gratefully accept the recognition for the outstanding reviewer. It’s always a good feeling to be recognized for something. This is the exact feeling right now after Food Control, a journal published by Elsevier recognized my efforts in reviewing papers on insects as food and feed. The award will go along way in motivating the insects as food and feed research team at JKUAT who are a great part of the journey. I recognize Jeremy, Forkwa, Carol, Weru, Nancy, Joyce, Samuel, Kamotho and Beth for their great effort in building a strong team. Let us keep going guys! It is our greatest pleasure to invite you to attend the 2nd International Conference “Insects to Feed the World” (IFW 2018) on May 15-18, 2018 in Wuhan, China. This comes after the 1st International Conference “Insects to Feed the World”, 14-17 May 2014, the Netherlands. This conference brought together for the first time a large assembly of stakeholders from all over the world. 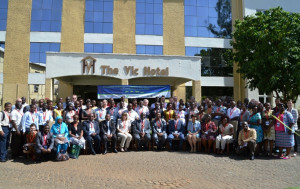 The conference marked an important step towards mobilizing the potential of insects as human food and animal feed to contribute to global food security and in particular to exchange information on the feasibility of mass rearing of insects to increase the availability of animal proteins in a more sustainable way. http://www.wur.nl/en/show/Insects-to-feed-the-world.htm. IFW 2018 to be held in Wuhan China on May 15-18, 2018 aims to address all aspects related to insects as food and feed and will bring together research scientists, government officials, and private sector representatives from the food and feed sector from both developing and developed countries. The overall objective of the conference is to engage in a global multi-stakeholder dialogue to further explore the potential of edible insects for food and feed security. Participants will discuss key aspects of the collection, production, processing, nutrition, marketing, and consumption of edible insects. Book the dates and for more information on how to participate, visit the conference site. A line of Keynote speakers consists the who-is-who in the edible insects’ arena including our very own Dr. John Kinyuru. I cant help but think of the feasting in this festive season. And what more do i ask but some really cool recipes to try with my bugs. I count on you! So here is how it will hapen. Make a good recipe which includes an edible insect of your choice. Post it here and let people pick the best. The winning recipe will feature in the upcooking bug cook-book by the JKUAT Insect Farm. The recipe will also be show cased at the JKUAT bug festival hapening next year. Include a photo if you like! Lets bug this Christmas people! This is a tribute to Prof. Alan Yen. The good Professor of Invertebrate Sciences at La Trobe University, Australia, passed away on Monday 20th March 2017. For several months Alan has fought hard, but unfortunately lost the battle with cancer. Alan was like the gigantic baobab tree that birds and animals lived on. He had these massive branches where people and even governments (he was Australian government advisor on something) hung on, and his roots went so deep and wide, voyaging seas and oceans…exuding the sap of scientific ingenuity and valor even to the dustiest places of sub-Saharan Africa. But death is death. And Alan has slept. I first met Alan in 2014 at the Conference on Insects to feed the world in the Netherlands, organized by FAO and Wageningen UR. He struck me as easy and outgoing, an impression I affirmed a year later during a study tour in Thailand. We were on a collaborative study visit to Khon Kaen Region to study the successes of cricket farming through the GREEiNSECT project. It’s incredible, something short of a miracle, how a government can support over 20,000 cricket farmers complete with subsides and ready markets. To be in Khon Kaen, One had to land in Bangkok where we spent the night. That evening, I met Alan. Again. It was at the dinner table. I was running late. I had lost count of time and jetlag was definitely at its peak after flying for an eternity from Nairobi. Someone cracked a joke about my being late and everyone on the table laughed…except me. And the Bangkok dinner began! We didn’t talk much, after all, we had a couple of days to catch up. about deep fried crickets on the menu? That can be easily arranged at any hour. Need to go shopping at some strange hour? There’s a store open. And in Bangkok, you never have to wait for a taxi…there’s one on your doorstep. Literally! Need to take a bus to Vietnam? There’s one around the corner! Thailand is just easy and I think this made everyone in our team easy, including Alan. After a couple days shuttling around cricket farms and cricket processors in Khon Kaen, the visit ended. A few sight-seeing episodes were encompassed in the official itinerary as well, including the visit to the cobra village. Everyone in the village has cobra as a pet! Yes. Small cobras. Huge cobras. Sleeping cobras coiled around themselves. Gliding cobras! A dog isn’t man’s best friend in this village. In fact, a dog doesn’t exist here! (That’s a story for another day). Did I mention that Alan had become the official group photographer? He had a nice camera, something not very common with scientists. I must say he was also good with the camera. Several months later, I received an email. It was from Alan. In his characteristic brief correspondence was a photo attachment with the words, “Hi John, I am still sorting out group photos but I thought I’d send this one to you directly. You looked happy here but I don’t think you were!” He had captured the shot at the cobra village. Boom! Well, fare thee on Alan. You mentioned on many occasions that cultures need to rethink their attitudes to eating insects. And in your own words, “the challenge now is developing technology to farm tens-of-thousands-of-tonnes of insect protein if we are to make an impression on world protein production”. We hope to see your words come true someday. You were the first Editor-in Chief of the Journal of Insects as Food and Feed (JIFF), the pioneering journal dedicated to publishing studies on insects as food and feed, and you were exemplary. You were brilliant! The edible insect’s community and the insectivores at Jomo Kenyatta University of Agriculture and Technology, Kenya will miss you. PS: Follow the blog to be receiving posts as hot as they come. Click FOLLOW at the top right of the page. I call my local guide on the third evening in Beijing. I feel like exploring and he suggests Donghuamen night market located in the northern end of Wangfujing. He is a jolly chap in his 20’s. I had bumped into him on my first evening in a restaurant along Jonguancun Avenue. Sometimes this Karma thing is true…how else do you explain walking into a restaurant and the first thing you see is a guy in a checked shirt, eating a mix of potatoes, beans, chicken, peas, cabbage and rice in a gallon of thick brown broth? The menu immediately sells him out and I salute “mundu wa nyumba”. Opposite him is his friend in another checked shirt eating all those constituents in a gallon of thick brown broth. I must say I didn’t have to pay for my dinner that day…i was home away from home! That’s how I met Denoo my guide…he became the go-to guy. He happens to be a graduate student from Kenya on a UCAS scholarship! God bless China! It’s easy to confuse the place for your typical food market. The place is always jammed with locals and tourists eating, chewing half mouth, chewing full mouth, talking, taking photos, others amazed by the mass and variety of food in just one 200-meter-long food street landmark. The food stalls are steaming with fresh food. As I get closer to one of them, I noticed that the food was not your typical type. It’s Chinese cuisine mostly. It is a hot spot for daring foodies giving more than what I expected or even bargained for. I realized that my taste buds might never forget this culinary experience. So there I was, standing in this small alleyway, an array of unnerving food in front of me, and I had to pick some for dinner. It took me a while I can tell you. I saw it, smelled it, walked past it once, walked past again, clicked away on my new Chinese branded phone though they didn’t quite like the clicking. I was enthralled. I had harvested, cooked and eaten insects before but I didn’t expect to see the options I had before me. My options were many: cicadas, sea stars, and sea horses, locusts, silk worms, snake, lizard, centipedes, frogs all on a stick! Well, I was hungry and I was here to experience some new flavors. My first choice went to locusts on a skewer. They didn’t look too bad. Not too adventurous I know but it was a beginning. We eat them where I come from after all. I could go with eating the Cricket as well. I farm millions of those and chew five toasted ones every morning. The snake was alright, the flesh smelled between chicken and octopus. It was not bad, quite flavorful actually. Now, this is when it got interesting! One display got my attention. Scorpions on skewers! When I asked the man behind the counter if they were fresh, he pulled out a bucket from under the table, a big smile on his face. Tens of these little guys were crawling all over. I hold the bragging right to being entomophagous in the South of Sahara; a daring edible insect’s enthusiast but NO. Scorpions wouldn’t do not matter what the vendor says. Not even if the vendor told me that frying the scorpions neutralizes their poison and their tail ironically is the most nutritious part rich with omega 3 fats. No! My mind was working 150%, trying to find a good reason to swallow a seahorse on a stick. Well, I was here for adventure. I settled for sea horse and scorpion after writing my will and safely depositing it with my now legal guide, Denoo. I opened my mouth, and took a good bite. Most were crunchy and tasted a bit like fried chicken and roasted nuts. The rest went down very quickly! Denoo kept wondering what kind of curse had come upon me. He thought I should be taking photos. Only. I came to see not eat. One day he will understand…maybe he will. Why worry if you accidentally swallow an insect? It happens every day. You’re out for a run or biking on the farmland, doing an evening round the fence run in campus and, whoosh, an insect lands in your mouth. The ick factor is high, but can it cause any real harm? Well…swallowing an insect is largely harmless. For real! us even eat a few critters. I am sure I’ve swallowed my fair share of insects. I know you are thinking its gross but it’s just a fact of life. The good thing with me is that I have intentionally swallowed quite a handful too. For the most part, eating a bug isn’t cause for worry. In general, your body will digest arthropods, which include arachnids like spiders, mites and ticks, and insects such as gnats, flies, mosquitoes, fleas and bedbugs, just like any other food. This means that eating a bug now and then probably won’t be a problem for most. beetles, termites, ants, spiders and other arthropods, eating bugs can be an important source of these essential nutrients. But, it’s a good idea to cook the bugs before eating them in order to generally kill any harmful bacteria and parasites. If you’re going to get serious about eating insects like me, cook it! I digressed. Going back to the story…the bottom line is, avoid swallowing uncooked bugs but if you do, the enzymes and acids in your gut will do justice to it! PS: Follow the blog to be receiving posts as hot as they come. Scroll to the bottom of the page and click FOLLOW THE BLOG. September is definitely a very exciting month! I am ecstatic about it all. Day after day a story on crickets is coming up in the Kenyan media. The titles were quite fascinating too! Feeling like a movie producer, venturing into an unchartered territory and we are the trail blazer ! The crickets are dancing on print, video and audio media! …am waiting to see what crops up next! Join the fun!